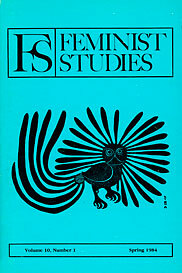 The structural transformation of the capitalist economic system in the period after World War II and the concomitant changes in women's lives provide the context for much of the work presented in this issue of Feminist Studies. Foremost among these changes have been the increased size of the service sectors in the advanced capitalist nations, alterations in the competitive positions of nations, the growth of state sector activities, the dramatically increased labor force participation of women, and a significant potential for greater autonomy and self-determination for women. 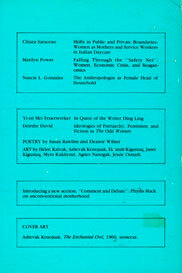 In "Shifts in Public and Private Boundaries: Women as Mothers and Service Workers in Italian Daycare," Chiara Saraceno discusses the Italian political context of the 1960s and 1970s, the response of the state to women's demands for childcare services, the shifting boundaries between public and private in the realms of both material and mental life, and the tension that arises among and within women as they seek to grapple with major changes in their mode of livelihood. Saraceno points out that women have different needs as mothers who also work for wages, as teachers in childcare centers, as full-time homemakers, and as wage workers doing the same kinds of service work for pay. In using childcare as her case study of state involvement in shifting boundaries, she reminds us of the curiously neglected place of children and their needs in feminist theory, thus extending the recurring discussion of motherhood in our pages. Her nuanced discussion of political movements, party and state responses, and the new and complex meanings of public and private that develop as the service sector grows, contributes new insight in the development of a feminist theoretical perspective of the state as well. An Essay on Unconventional Motherhood"